No book of the Bible was so influential and popular throughout the Middle Ages as the Book of Psalms. The poetic texts were sung and recited in church and monastic services each day of the week, and young boys would be taught Latin by reading and memorizing them. 280 x 202 mm. – 204 leaves. 20 illuminated initials, two of which historiated. Contemporary binding. As beautiful and symbolic poetry, not all verses of the Psalms were easily understood. Essential and important, the texts were studied and explained by theologians. 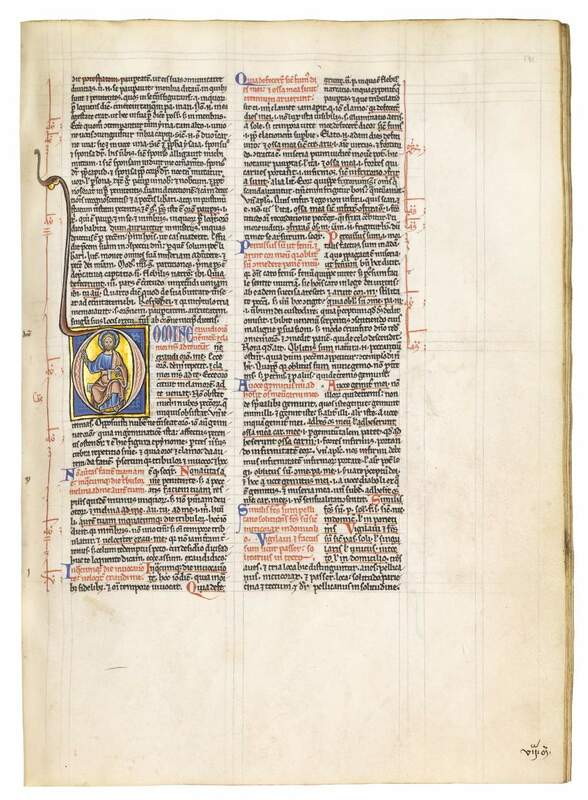 When Peter Lombard (c. 1100-1164) in Paris compiled his commentary on the Psalms, the manuscripts with the Psalm verses and commentaries required a special, rather complicated layout that was professionally organized. The lines setting out the complicated page arrangement are still visible here. In the centre, the verses were first written in red ink. The commentaries following the verses were then added in black, with abbreviations and key words underscored in red. In the margins, abbreviated names of sources are written in red: Augustine, Cassiodorus, Jerome, and others. At the same time, a system of reference signs was developed. The eight important Psalm divisions and even each of the 150 Psalms begin with a large, finely painted initial. Smaller initials in blue, like in this example, head every verse. Any newly founded church or monastic institution would need a number of books, often presented as gifts by the motherhouse or by a wealthy person. The Book of Psalms could then be bound in gold or silver, marvellously adorned with gems, enamel plaques, or ivories. This unusually dignified and exceptionally carefully prepared codex of Peter Lombard’s Commentary on the Psalms was a precious commission – far above the usual quality of a scholastic study book. With its fresh colours, highly burnished gold, and fine script, this is an extremely elegant manuscript dating around 1200. The codex may represent a prestigious gift, ordered and made in Paris for what we know as its first owner, the Benedictine abbey of St. James in Liège. Such an intricate layout as we find here accelerated the professionalization of book production executed by professional secular scribes and artists.